Over the last few years, the federal and many provincial governments have weakened incentives for entrepreneurs by raising personal income taxes. This budget season, which includes the Trudeau government’s 2019 budget next week, provides an opportunity for governments across Canada to reverse this trend and introduce tax policies that would attract, encourage and retain entrepreneurs. In 2015, the federal government introduced a new 33 per cent tax bracket for entrepreneurs, professionals and successful business owners. Similar tax changes in Ontario, Alberta, British Columbia and several other provinces compounded this higher federal tax rate. Consequently, the personal income tax rate imposed on these Canadians now exceeds 50 per cent in seven provinces with the remaining provinces within a hair of 50 per cent. In addition to higher personal taxes, new and expanded federal and provincial regulations have made Canada a much less hospitable and attractive place to start a business, expand an existing business, or invest new capital. Moreover, the decision about where to locate a new business is, in part, influenced by differences in income tax rates between jurisdictions. Take the example of an engineer who’s considering whether to start her new firm in Canada or the United States. Among several factors, the differences in personal income tax rates between the countries stand out. Despite taking on considerable personal risk, she would face a combined top tax rate between 47.5 and 54.0 per cent in Canada compared to a low of 37.0 per cent in the U.S. Her time and effort in starting the new business provides a much lower reward in Canada. She will likely decide to live and work in the lower tax jurisdiction. 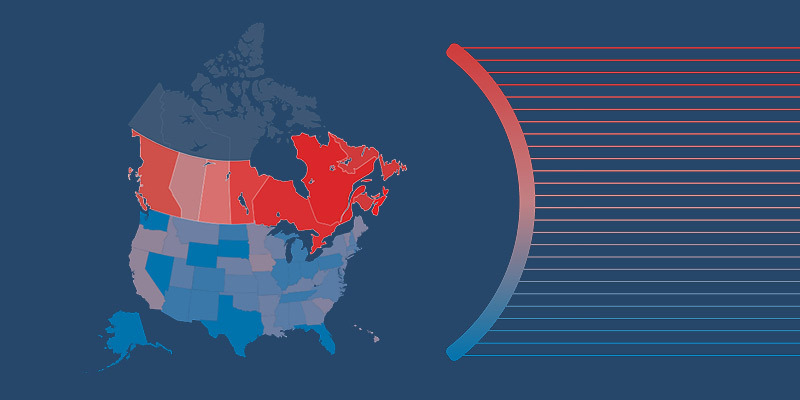 Indeed, the U.S. is Canada’s largest and most direct competitor in attracting and retaining entrepreneurs. A recent study demonstrated that Canada’s personal income tax rates are markedly less attractive for entrepreneurs than rates south of the border. For instance, the list of 10 jurisdictions with the highest combined tax rates at $150,000 of income among the U.S. states and Canadian provinces are exclusively Canadian provinces. In other words, no U.S. state—including high tax jurisdictions such as New York, California and New Jersey—have higher personal income tax rates at this level of income. Canadian tax increases come at a time when the U.S. government has implemented sweeping tax reforms to push tax rates down for business owners and entrepreneurs. To make matters worse, Canada’s top combined personal income tax rates are among the highest in the industrialized world. Out of 34 OECD countries, Canada had the seventh highest combined top tax rate in 2017. This should be eye-opening for policymakers, as Canada is at a huge tax disadvantage for attracting and retaining entrepreneurs who we rely on for innovation, employment growth and general economic prosperity. Clearly, high personal income tax rates have made Canada a less desirable place for entrepreneurship. During this year’s budget season, the federal and provincial governments must reduce personal income tax rates to create an environment conducive to entrepreneurship, risk-taking and growth.